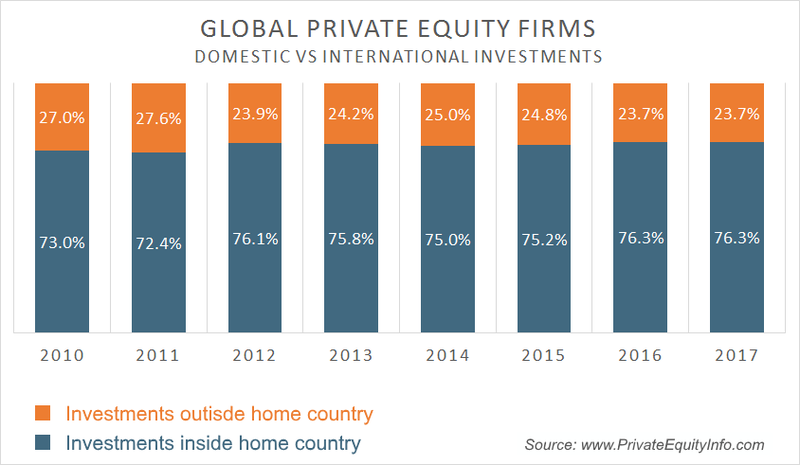 As an industry average, private equity firms tend to hold approximately 25% of their portfolio companies outside their home country (and 75% domestic). This 25-75% mix of domestic vs. cross-border investing seems to hold fairly constant over time. We often hear about international financial institutions buying U.S. companies. Our data shows 5 – 7% of all U.S. portfolio company investments made by private equity firms are from international private equity firms. In a previous post, I looked at capital raises from 88,000 Form D filings from 2014 – 2016. For this post, I mapped the distribution of fund sizes in 2016 from Form D filings (ignoring funds less than $5 million). Although the fund size distribution is somewhat flatter than expected, there’s a definite concentration in the $100 – $250 million range and a steep drop off for funds with $1 billion or more. This is consistent with the private equity fund sizes we see in our database at www.PrivateEquityInfo.com (we don’t use Form D data in our database). The next chart shows how this has changed over time, comparing the same 2016 data to 2015 and 2014. Private equity activity has increased dramatically since the launch of our Research Database in 2005, especially in the middle market – more firms, substantially more capital. Besides our own internal database, year-to-year changes in Form D filings provide another indicator for private equity capital raising activity. Using data from 88,000 Form D filings over the past three years, I compared the capital raising trends for private equity funds, hedge funds and venture capital funds. I previously discussed the trend in median holding periods for private equity-owned portfolio companies. However, there is a significant standard deviation in the data. The histogram below shows the distribution of holding periods for portfolio company exits in 2016. The data revealed two interesting insights… one driven by macro-economics, the other cultural. I previously discussed creating a portfolio of 560 publicly-traded stocks based on private equity ownership in each company (the PE-basket). While the last post focused on the overall performance of the PE-basket relative to benchmarks, I thought it would be insightful to look at individual company gains and losses within this basket. While the average return for the PE-basket was 4.0% over a five-month period, 41 of these companies returned greater than 50%, 11 companies topped 100% and three companies exceeded 200%! Although private equity firms normally invest in privately held companies, on occasion, some firms will invest in publicly traded companies… or will retain shares in portfolio companies that are now publicly traded. A quick study of the www.PrivateEquityInfo.com database in late November showed 306 private equity firms collectively held 560 publicly traded-companies in their portfolios. From these 560 publicly-traded companies, I created an equally-weighted basket of stocks (PE-basket) to track through time. Now that several months have passed, let’s check the performance (thus far) of this PE-basket relative to several benchmark ETFs. If you are considering financial buyers to close your deal, odds are, it won’t be one of the larger private equity firms at the closing table. In 2016, we consistently added 450 – 500 new private equity portfolio companies to the database every month. While the most acquisitive private equity firms were those brands we all recognize, there was something fundamentally interesting in the data. Holding periods for PE-owned portfolio companies correlate with macro-economic events – lengthening during recessionary periods and shortening during growth & recovery years. 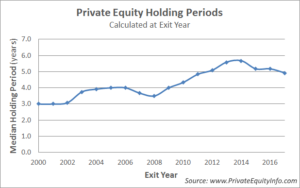 The most recent data from www.PrivateEquityInfo.com shows median portfolio holding periods (4.9 years) trending down as PE firms capitalize on enhanced valuations. The peak was 5.7 years in 2014. For exits in 2014, the median holding period slightly increased to 5.8 years. These exits mostly represent portfolio companies that were acquired at the peak of the last bubble (2008), prior to the recession and likely at higher valuations. Looking forward, will the holding period decrease as the data begins to reflect acquisitions made during the recession or has the holding period of the private equity firms fundamentally lengthened?